Hello there! 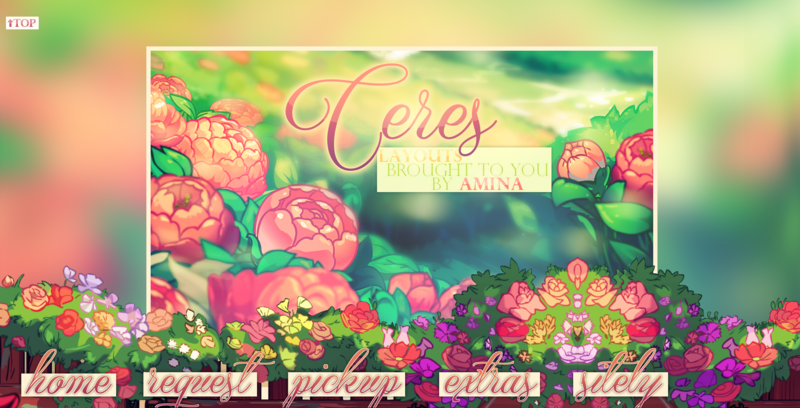 Welcome to Ceres, a twin site of Eris providing custom petpage layouts made by me, Amina. Unlike Eris, this site will be operating seasonally, with requests only opening during observed breaks and holidays. Requests are generally open throughout the summer. Due to the lack of sites floating around in the site community nowadays, I will be directing my focus at creating layouts for newer sites getting started. This means that I am much less inclined to make personal pages like portfolios, wishlists, etc., but feel free to send your requests in if I am specifically taking those requests! Selena's layout is 100% complete! View the live preview? Whewww finally done with all of the requests! I'm not sure when requests will be opening again as I'm a little burned out right now but keep checking back for updates if you're interested! Alexa's layout is 100% complete! View the live preview? Tiffany's request is 100% complete! View the live preview? +1 request! Since I've already knocked out a request I'll leave requests open until I get another. One new affiliate, Krazy Kute Kreations! Opening requests earlier than expected! For now, all request styles are open and I'll probably take the first 3 requests. I most likely will not be working on these as fast as I did with the first batch. All requests have been completed! View the live preview for Angela's layout? One new affiliate, Fleur! It's a wonderful little site offering fake avatars, and its grand opening's occurring sometime this month! Ash's request is 100% complete! View the live preview? +2 requests! I know I said I'd be taking only two but I can handle one extra. All request styles are now closed. Heather's request is 100% complete! View the live preview? Leave the credits as is. If, for whatever reason, you absolutely must alter the credits, please make sure you link back to this site in some fashion, and appropriately credit any resources, textures, etc. used in the layout. * asterisks indicate required fields on the forms. Please fill these parts out. There are three types of requests: the new site bundle, the site upgrade, and the standard layout request. You MUST select the appropriate request type corresponding to your site type. Information for each is located on the next page. You may only request one layout every month, regardless of request type, provided that requests are still open. Resend your form if you do not hear back from me within 5 days. Please use the layout I make for you for at least one month. You will be permanently blacklisted from requesting if you fail to do so. Of course, if you're unhappy with any aspect of your layout, I will do my best to fix it until you are completely satisfied! After I have accepted your request, I will send you 3 neomails throughout the course of the design process: one to confirm that I have received & accepted your request, one to confirm my rough draft with you, and the last to inform you that your layout is completed. Your reply to my 2nd neomail is particularly vital because it allows me to make any necessary changes to the basic design before I continue with the final product. If you give the OK at this stage, then I will continue until I am finished. Therefore, it is highly suggested that you regularly check your inbox after requesting so that your layout is completed as soon as possible. Your request will be put on hold indefinitely until I receive your reply. I'd prefer you have a general idea about how you want your layout to look. I highly recommend that you send me a rough sketch of your vision on a petpage. Don't worry about it looking pretty; some rectangles produced in MS Paint will do! I can work with most images, be it neo-related, fandom-related, etc., provided that the images are large and high quality. My layouts tend to be more Graphic-based, so I will tend to use graphics over CSS to style certain elements. 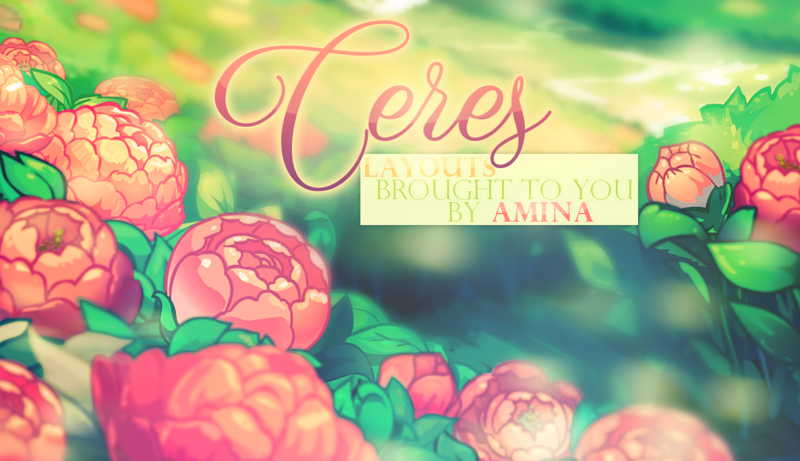 However, you can specifically ask me to use CSS for certain aspects of your layout if you so desire! I can make both anchored and scrolling style layouts. You should also specify the style and type of navigation used (if applicable). For navigation/menus, they can be graphic/CSS-based, located at the top/bottom/side of your page, and displayed horizontally (inline) or vertically (block). I check my layouts in Google Chrome and Microsoft Edge, and with a screen resolution of 1980 x 1080. You should let me know if you want me to make your layout friendlier for smaller screen resolutions. Refer to my portfolio for examples. Please neomail me if you need any assistance filling out your request! Site must provide a service of some sort. This includes requests, directories, premades, adoptables, guides, etc. If you are unsure if your site fits this criterion, then please neomail me. In addition to your layout, you may bundle your design with several add-ons including, but not limited to, custom resources, icons, graphic headers, etc. I can make anything your site may need to get started upon request! This request type generally takes up to 2 weeks to complete. This request style is for older sites looking for a fresh, new layout. All of your site's content will be transferred to your new layout unless otherwise requested. This request type generally takes up to 1 and a half weeks to complete. All sites: includes personal pages like portfolios, wishlists, lookbooks, etc. You will simply receive a coded, custom layout. Please keep in mind that this is a low-priority request option, so I will generally complete other types of requests before tackling this kind. This request type generally takes up to 1 week to complete. Click for the current waiting list? You may select up to three add-ons. Just add the corresponding number in the bolded parentheses and the specifics to your form! EX 2: (6) just back signs, (8) 2 spins! Copy & paste the form into a word processor and fill it out. Feel free to fill it out even when requests are closed and save it for when they do open again! You may also store your form on a petpage if it gets too lengthy, just make sure you send me the link. If you're dissatisfied with any particular aspect of your layout, please neomail me back so I can fix it. Click on the image for a live preview of the layout! The code will be located on the page. Layouts will be moved to the portfolio after one week. While I do typically save the code for every layout I make, I highly suggest that you to back up the code yourself in case I lose it for whatever reason! Consider giving us a rating at Refresh. Any feedback is greatly appreciated! All other resources were made by me!